Anderometer® Instrument for measuring noise and vibration in Assembled bearings. The Anderometer® Instrument is used for production testing by bearing manufactures, in receiving inspection departments of major ball and roller bearings, and by manufactures of equipment whose satisfactory performance relies on the long life and noise-free operation of its multiple-element bearings. By rotating the inner ring while restraining and axially preloading the outer ring of an assembled bearing, and electronically analyzing the resultant vibrations, the Anderometer® Instrument measures and numerically rates, in anderon units, the complex cam action produced by irregularities in the race and ball or roller surfaces. The Spindle is a motor driven hydrodynamic spindle having the high degree of radial and axial stiffness needed for high-accuracy measurements of vibration of bearings under load. It is rotated at a constant 1800 rpm, the accepted standard speed that approximates a realistic operating speed for most bearings. 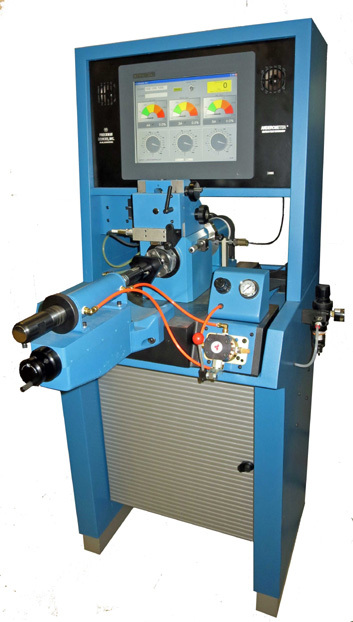 The spindle is driven by flexible coupling from a jackshaft to minimize the effects of drive-train vibration, and any residual rotary imbalance or eccentricity in the part or tooling is electronically filtered out by the computer used with the instrument. The Anderometer jackshaft and spindle are mounted to the heavy baseplate of the cabinet-type stand that houses the motor, and are driven by multiple elastomer O-rings belts. The large mass of the baseplate further reduces vibration and provides stability. The motor itself is dynamically balanced, and slippage and the transfer of extraneous vibration are effectively eliminated. The BFE pneumatic preloader is attached to the baseplate of the BDN Stand, provides an operator-selectable preload force of as much as 45 kg (100 lbs) to the spindle (and bearing) axis. The force is transmitted through a 3-point contact pressure plate  the BLF or BLG  to the non-rotating face of the outer ring, providing simulation of actual operating loads. The BLF Pressure Plate is used for bearings having O.D.’s 76 mm (3”) and smaller. The BLG Pressure The Plate is used for bearings having O.D.’s form 76 mm (3”) to 152 mm (6”). The BCC Converter, a velocity transducer, when brought into contact with the non-rotating outer ring of the bearing being tested, while the inner ring is rotated, senses the radial vibrations and generates the electrical signals that are transmitted to the computer. The BAC computer receives signals from the Type BCC Converter, amplifies and integrates them, and displays the result on three meters, covering three ranges of vibration frequency, in a “anderon” units  the angular derivative of radial displacement. The low-band, medium-band and high-band meters show the average amplitude of radial vibrations occurring, respectively, 1.7  10 times per revolution of the inner ring, 10-60 times per revolution, and 60-330 times per revolution. An audio loudspeakers permit detection of defects occurring too randomly to register significantly on the meters. A tachometer monitors spindle speed.